At DCS Multiserve, our professional teams are well experienced in delivering an impeccable commercial cleaning service to all types of business premises. From large warehouse units and factories, to shop floors and showrooms, workshops and retail units, DCS can provide you with a professional, cost effective and hassle free service that maintains the hygiene and cleanliness of all parts of your premises. DCS Multiserve’s wealth of cleaning experience means we can offer regular office cleaning services, to cover the maintenance of all communal staff spaces and washrooms. Alternatively, if you require a more specialist clean for a factory or industrial premises, in adherence to your on-site Health and Safety requirements, our team will deliver professional service that is second to none. 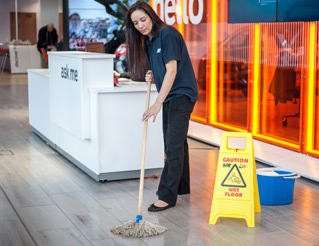 At DCS Multiserve, we use the latest in cleaning technology and techniques and work in partnership with our equipment suppliers Nilfisk and Karcher UK, to ensure we are constantly at the forefront of the market for commercial cleaning providers. 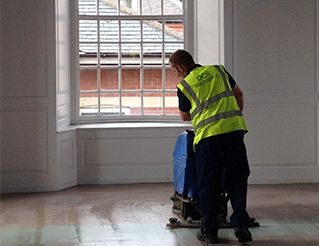 All our commercial cleaning work is conducted efficiently by our fully-trained, uniformed operatives. To ensure we are delivering the best possible service, we appoint an area supervisor at the start of your contract, to monitor the work. Your assigned supervisor will liaise with a site contact on a monthly basis, conduct monthly cleanliness audits and hold weekly meetings with the onsite DCS operative(s) to ensure that all work is kept at the high standard you and your business deserve. To find out more about our commercial cleaning services, give us a call today on 0191 216 9000 or email enquiries@dcsmultiserve.co.uk.